Summary: Living in Iran in 1988, Farrin attends a girl’s school working to become educated to help lead a future Iran. An outsider with no friends, Farrin’s life takes a turn for the better when Sadira, a new student at school, befriends her. Their friendship improves their grades as they study together, and new feelings are stirred within both of them as they continue to share in each other’s lives. But Iran is not a country that accepts homosexuality, and before long Farrin and Sadira are labelled deviants and advised to change their behaviour. Convinced there is nothing to be ashamed of in their love for each other, Farrin and Sadira plan a secret meeting and an escape from both of their families. Their hopes for the future come crashing down when they are arrested, and Farrin can only hope that her wealthy family will rescue her and Sadira from execution. Review: Above everything else Moon at Nine by Deborah Ellis has to offer, it is first and foremost a love story. Though I would have wished for a less tragic ending, Ellis’ historical fiction setting and the fact that her book is based on a true story means the ending was predestined. Moon at Nine is quite frankly one of the most powerful love stories I have ever read, as Ellis shows her reader love is love, no matter what the sexual preference of those involved. My favourite memorable quote is the last one, because Sadira’s words capture the true nature of love, making a choice to care about someone no matter what others think. I could almost imagine her saying those words as vows in the wedding she and Farrin never got to have. With a backdrop of an almost post-war Iran, Farrin and Sadira are vibrant and inspiring characters consciously deciding to live in the moment by clinging to each other in the face of great opposition. Ellis’ writing is passionate and informative, creating a realistic and frightening picture of Iran’s reaction to homosexuality. I could say more, but I would prefer to let Ellis’ story speak for itself. Moon at Nine is certainly worth putting on your to-read list. “‘The world is run by demons,’ Sadira said. “All I have now is my book about demon hunting and my memories of you. If that is all I ever have in my life, it is enough. But I am not yet ready to bow down to the demons that run the world! “But first and most important, we are human beings with a right to choose for ourselves how we want to live. All we have is our lives. Each person gets just one. We owe our parents and the revolution our respect, but we don’t owe them everything. And everything is what they want. I choose you, not just because you are wonderful and not just because you love me. I choose you because the act of choosing you belongs to me. It is mine, my choice, my free will. I choose you over my father. I choose you over my country. And even if you decide you don’t want me, I still choose you. 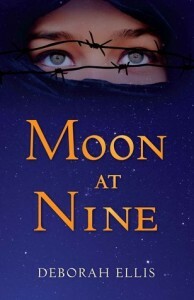 Moon at Nine by Deborah Ellis is published by Pajama Press, (2014).